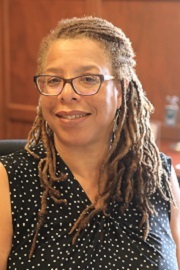 San Francisco—The California Supreme Court has named Lisa Ferguson Walker as the new director of its 15-member Civil Central Staff, effective October 1, 2018. Walker replaces Emily Graham, the director for the past ten years, who recently retired after serving the court for 29 years. Walker is the first African American attorney to serve as a director for the California Supreme Court. The members of the Civil Central Staff prepare memoranda on petitions for review and related civil matters and State Bar filings. The justices rely on the staff to help select the civil matters in which they grant review for written opinions. Walker, a graduate of U.C. Berkeley—where she received her B.A., and then a J.D. from Berkeley Law—was admitted to the California Bar in 1989. The court has two other central staffs. The Criminal Central Staff prepares conference memoranda addressing petitions for review and habeas corpus petitions in all criminal matters except capital cases. The Capital Central Staff assists the justices in the adjudication of death matters, preparing memoranda and draft opinions addressing capital appeals, habeas corpus petitions, and related motions.